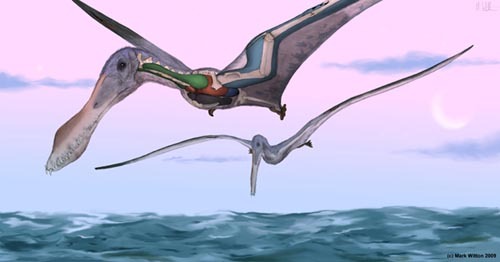 Air sacs under their skin may have helped pterosaurs stay aloft [Credit: Mark Witton]. Seventy million years before birds took flight, pterosaurs – some as large as a small airplane – somehow soared through the Mesozoic skies. Scientists have speculated for decades about how the winged reptiles kept their enormous bodies in the air. Now, researchers have reconstructed the pterosaur’s breathing system, showing that air-filled bones and air sacs under the skin extended lung capacity and helped these reptiles take flight. This study is among the first to investigate the respiratory system of the extinct reptile, said Leon Claessens an evolutionary biologist at The College of the Holy Cross and a co-author of the study. Since soft body tissue doesn’t normally fossilize, rebuilding a pterosaur lung wasn’t easy. The research team compared bone scans of extinct pterosaurs and X-ray images of birds and crocodiles breathing. They are the pterosaur’s closest living relatives. The scientists discovered that, like birds, the hollowed out areas in pterosaur bones were filled with air sacs, tiny out-pockets of the lung that invaded the bone. These air sacs increased lung efficiency by acting as a bellows – allowing the lungs to maintain a fixed volume with fresh air constantly flowing through, unlike human lungs that inflate and deflate as we breathe in and out. The extensive air sac system found in pterosaurs likely allowed them to evolve to gigantic proportions, Claessens said. And he added, the reconstructed pulmonary system holds exciting potential for new investigations of pterosaur behavior and powered flight. Watch out Boeing. Interesting, you never hear much about Pterosaurs, dinosaurs get all the press. If the air sac system allowed pterosaurs to grow to enormous sizes and still remain relatively light, you wonder why we don’t find birds this big today.